I had written about a client of ours named Sabrina several months ago (see A Work in Progress – Sabrina’s Story). 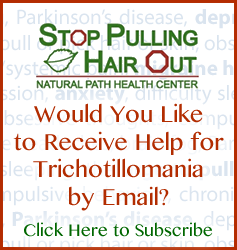 We’ve been working with Sabrina for a couple years now for trichotillomania and OCD. Sabrina had shown dramatic improvements in OCD before the original post, and she had dramatically decreased her pulling, but she still had the urges to pull occasionally. Sabrina is now 17 years old and I just spoke with her mom; here’s an update. Sabrina now rates her trichotillomania as ‘almost nonexistent’ and rates her urges to pull at a 0-1 on a scale of 1-10 (when we started she had rated her urges as 8-10 and had pulled many bald spots on her head). Her hair has been growing back in for many months with no new episodes of pulling. Both she and her mom reported that she wasn’t pulling and that she now even rarely plays with her hair. Her hair has grown back well enough were she has decided to start going out with friends again, and is going to get back into swimming (something she has avoided for many years because of fear that others could/would see her bald spots). She said she feels like ‘trich is gone’ and she is looking forward to not having it return (as are we!). She says her OCD is a 2 on a scale of 1-10 and that the only time it comes up is around stressful events (i.e., math homework and motocross competitions, which is her new favorite pastime). However, she said the episodes only last a couple minutes and are gone. As I stated in the original post Sabrina’s case was unusual that it took a very long time (~ 2 years) to get her neurotransmitter function under good control for her to see substantial change. However, even in cases like this, she experienced dramatic change over time. It certainly didn’t happen all at once, but it did happen; and we couldn’t be happier.